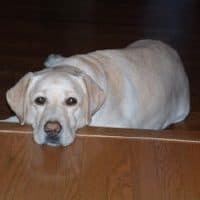 Do you have friends over to watch the Academy Awards? 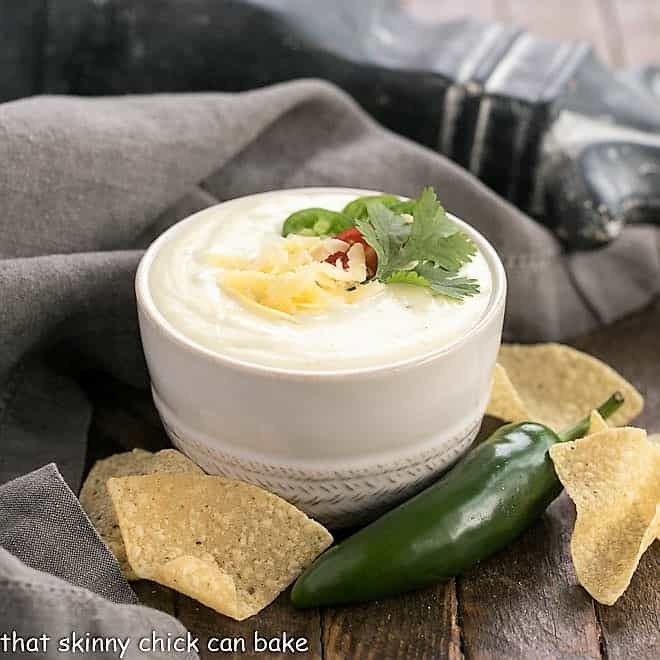 It’s time to channel your inner Wolfgang Puck and create a spread full of small bites to assuage any hunger pangs. 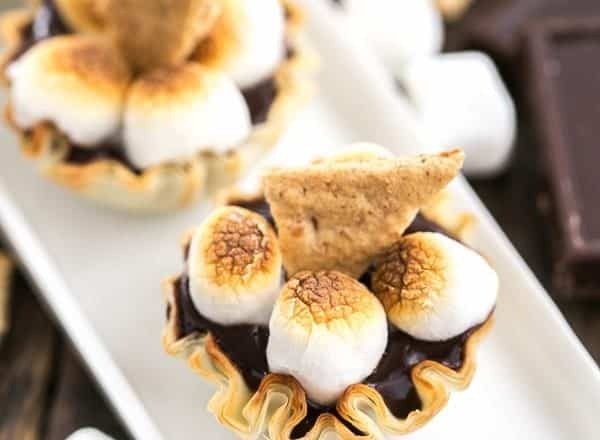 Tiny desserts like these Mini S’mores Tarts are the perfect choice for an easy, irresistible sweet nibble on your party buffet. These little gems are super simple to prepare but sure look fancy. 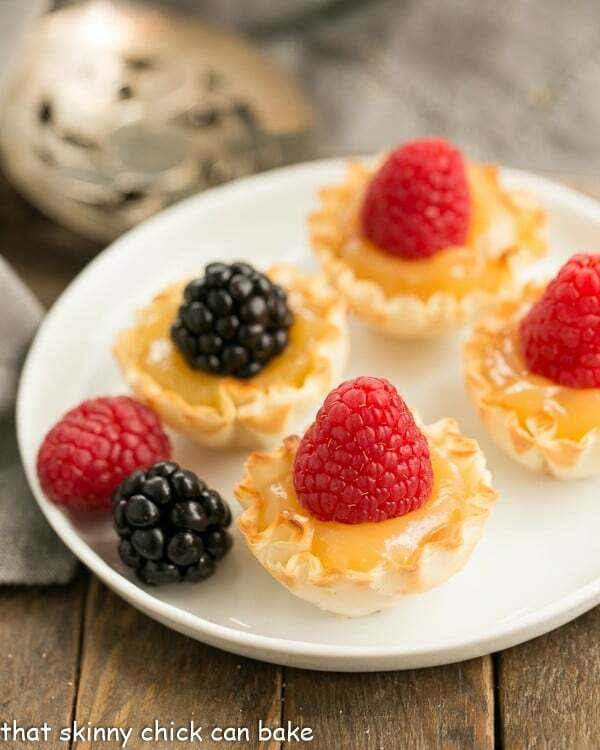 Using mini fillo tarts make short time of preparation. They’re already baked and just need to be filled. I melted together some chocolate, cream and butter to make a simple ganache. A few mini marshmallows and a shard of graham cracker created the s’more trilogy. I also had a jar of lemon curd and some berries in my fridge. The citrus version was a lovely option for those who aren’t chocolate fans (gasp). As much as we love chocolate at our house, I still make sure to have an alternate flavor. Lemon works perfectly. Both versions were a hit with my family! More Fancy Appetizers for Your Next Bash! The Sunday Supper Tastemakers have you covered for your next cocktail party! Thanks to Wendy from Wholistic Woman for hosting us this week! 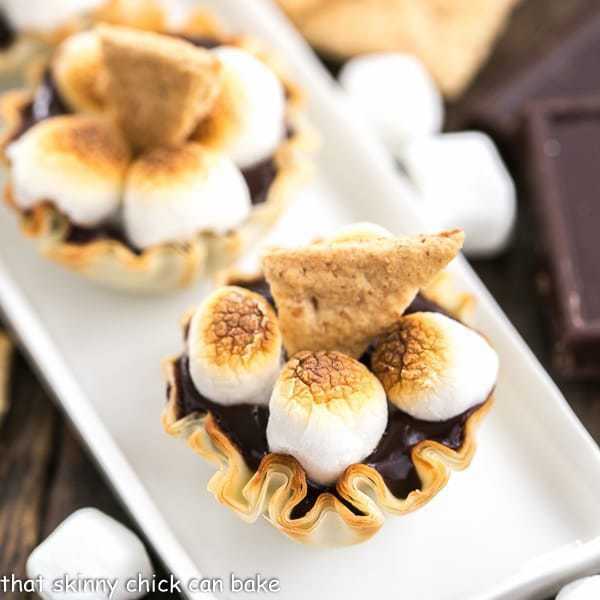 Add my raspberry topped mini cheesecakes to your baking list, too, as they’d be marvelous paired with these s’mores tarts. Mini desserts suitable for any gathering! 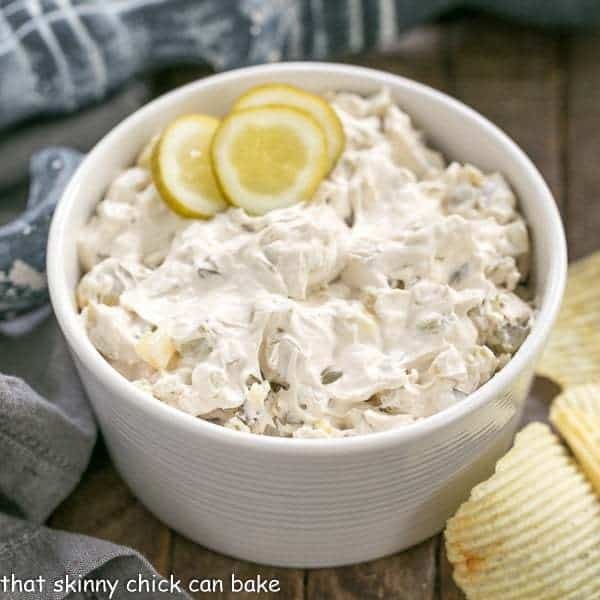 And super easy to make! Remove fillo shells from the freezer and place on a baking sheet. In a microwave safe bowl, combine chocolate, cream and butter. Gently melt in microwave using 30 second increments, stopping to stir frequently, until chocolate mixture is smooth. Divide chocolate ganache between tart shells. Top each with about 4 mini marshmallows. Turn on broiler and place tarts in oven. Watch carefully until marshmallows are lightly browned. Remove quickly so they don’t burn. 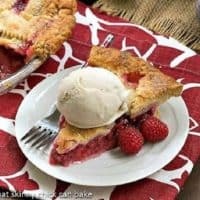 Insert a graham cracker shard into the center of the tart. 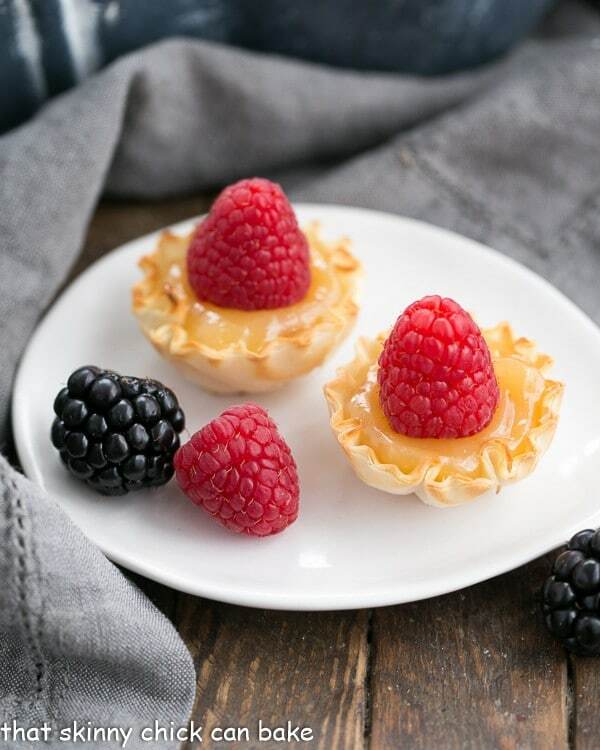 For another option, fill tart shells with lemon curd and top with a fresh, ripe berry. Both chocolate and lemon are so pretty! How fun! I love these little tarts of comfort goodness. They look fantastic! Love s’mores they remind me of summer and girl scouts. Nice thought to have with 30″ of snow coming! HI Liz, both tarts look delicious, I think I would have at least one of each. 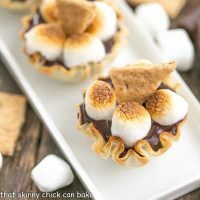 I feel like I can never quite get a traditional s’more right (it’s getting the chocolate to melt), but these pretty tarts I could totally do! So pretty, and delicious! I want to come to your party and snuggle up with a plate of these! They look amazing! I do love dark chocolate but, in this case, I think I’d opt for your gorgeous little lemon tarts, Liz. They are both gorgeous, of course! How can I choose between the two? These are the perfect size to enjoy a few of each….Brava Bella! Those shells are the perfect solution for dessert in a flash! Love that you prepared them two ways. I’m all about anything with melty marshmallows on top! These look amazing! And they are beautiful! Perfect Fancy Appetizer! I am so going to try these! These look so good!! I am drooling!! 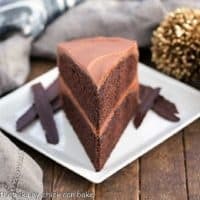 This is a perfect sweet bite! I love desserts that you can eat with your hands! These shells look so adorable! Great idea as appetisers, Liz! Lizzy love smores !! Look delicious!!! Happy Valentine’s day dear!! All the flavor without the mess! 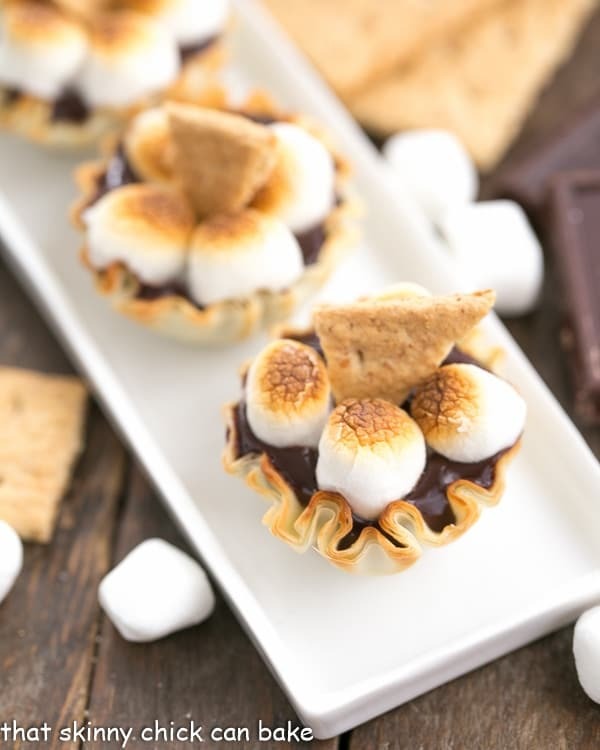 Too cute and the perfect s’mores bite! What a great treat. I think everyone should buy these products to have on hand for those unexpected guests. Awww…these little gems are too beautiful. But they sure make a perfect companion for elegant appetizer. Love these mini bites. These are adorable, and even better, fast! 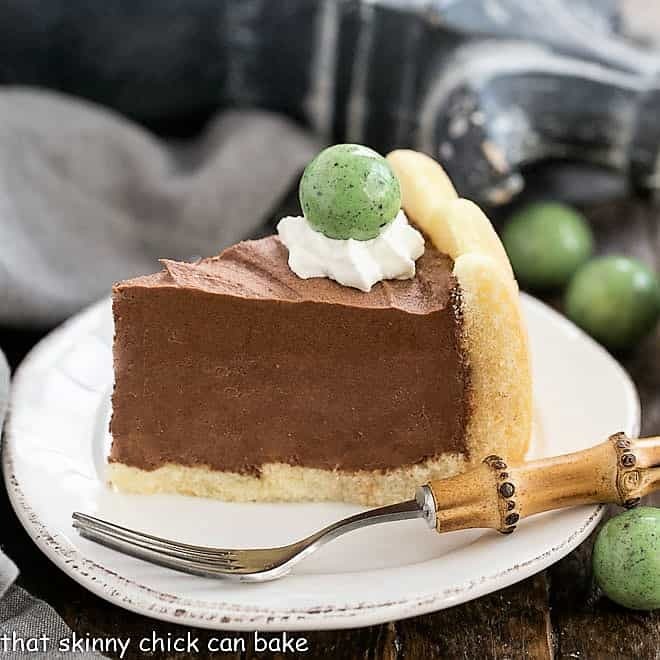 I have a non-chocolate lover, so I like the lemon idea too! 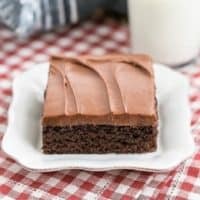 Easy to make and easy to eat, I love these! If I showed up to a parties and these were there I would just straight up decide I was staying there forever. These looks good for any time of the day treat … Lovely creation Liz. Can these be made one day ahead? Also, how do you think they’d be with cinnamon graham cracker shards? Thank you! Yes, they can definitely be made a day ahead and the cinnamon graham cracker shards sound yummy!! !